Sarn Jewelry from "Planet of Fire"
These screen used props were used in the Doctor Who Story "Planet of Fire" staring Peter Davison as the Doctor, Mark Strickson as Turlough and Nicola Bryant as Peri. This 21st season four part serial (6Q) was first transmitted on 2/23/84. 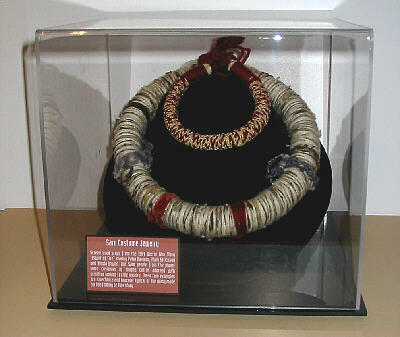 The people from the planet Sarn wore costumes of draped cotton adorned with primitive looking textile jewelry. 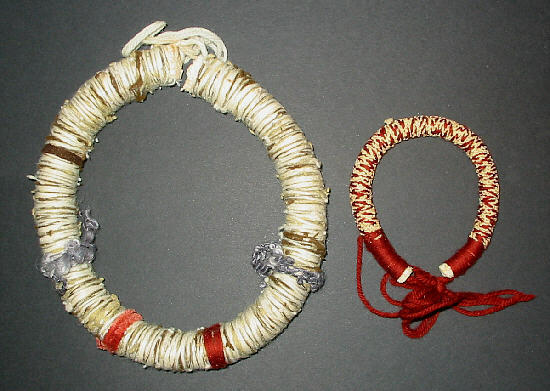 These two examples of the jewelry are a necklace and bracelet typical of the many made for the filming of this story. 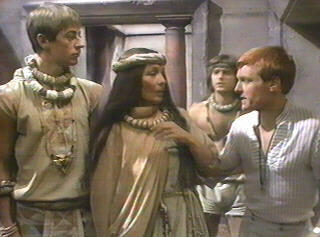 The Doctor, Turlough and Peri are drawn to a planet on the brink of volcanic disaster. They must defeat the Master's evil plan before the Sarn are destroyed and Turlough misses his chance to return home. I purchased the Sarn Jewelry from the collection of Matt and Sarah Parish and in December 2003. They now resides in my Dale City Virginia collection. The display is made of a 9"X9"X8" acrylic box with a black base. A jewelry store black velvet neckline display used to show fine gems supports the pieces and holds them at a easy to view angle. A description placard sits on the base.